With ACSM's Certification Review as your guide, you can be ready to successfully pass the exam to become a Certified Personal Trainer (CPT), Certified Exercise Physiologist (EP-C), or Certified Clinical Exercise Physiologist (CEP). As a review tool, this text will help you identify your strengths and weaknesses and then eliminate those areas of weakness with further study. Most importantly, this text will help you advance your career in fitness and exercise. Now aligned with the tenth edition of the ACSMs Guidelines for Exercise Testing and Prescription, this text is reflective of the key changes and the only print resource for the current ACSM certification exams. 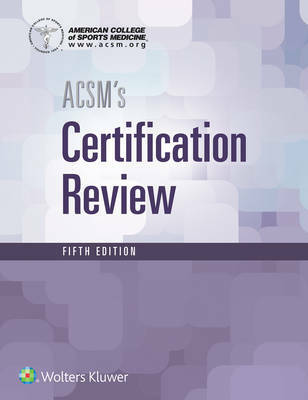 ACSM's Certification Review is organized into three parts by certification level.